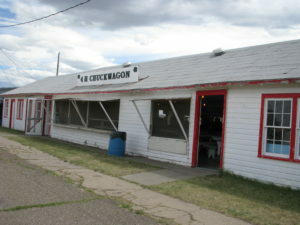 The Chuckwagon, July 20, 2014. She was torn down Monday, August 21, 2017, Eclipse Day. The building, along with several others, were WPA projects back in the 1940s. Chuckwagon building, Hill County Fairgrounds, July 20 2014, razed August 21, 2017.